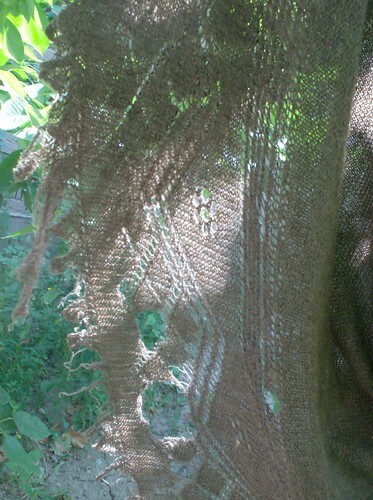 Perhaps the most exciting bit of fiber arts I saw on my trip was completely by accident – my host family brought me to an uncle's house as a guest, and as I was wandering around in their garden in the morning I saw a tattered brown shawl hanging up on the clothesline to dry. I examined it for a moment, and saw it was knitted lace. It was a large triangular shawl, with a garter stitch center section and two-part border – a lace section and a scalloped edging. 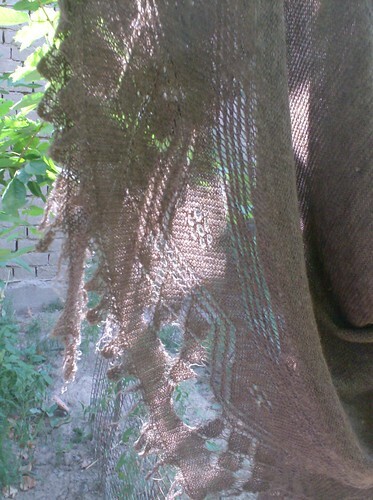 It was knit out of very fine brown wool, two plies that made up a very light laceweight – probably hand-spun. The shawl was obviously well-loved and worn, as it had a number of holes in it (horror), most of which had the loose stitches caught with thread or darned over time. A few of the corners were an absolute mess, which broke my heart a little. It was a beautiful shawl, and certainly a sight to see in its time. Unfortunately I wasn't able to get any information on the origin of the shawl from the family (when they noticed me admiring it, there was a brief exchange of “Do you like it?” “Yes, it's beautiful” before the subject was changed). However, considering the Soviet influence of the country and the fact that many Tajiks travel to Russia, I would say it's certainly a handknit shawl in the Orenburg tradition. 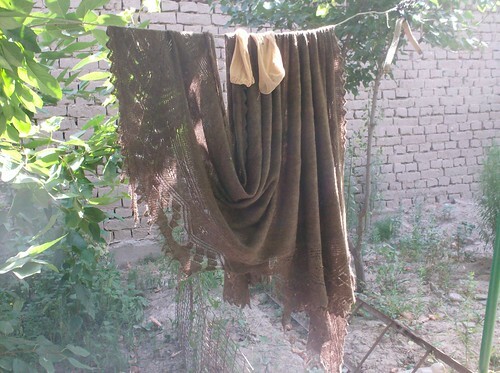 I would have loved to learn more about this shawl from the source – was it knit there, or in Russia? Did they make it or buy it? Where did the yarn come from? But all I can do is guess.